In the 2011 National Census over 600 unique answers were given to the question “what is your main language”, reflecting the linguistic diversity of the United Kingdom, not only as a result of migrant languages brought to the country, but also due to its own regional and minority languages. As a result of the free movement of peoples within the European Union, 2.9 percent of the population speak a language from one of the other 27 EU member states as a main language. With 546 thousand speakers, Polish is firmly in place as the second most spoken language in the country. 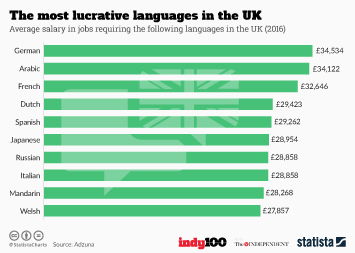 As the nation’s capital, perhaps it is unsurprising that London is the most linguistically multicultural part of the United Kingdom, with 22.1 percent of its residents having a main language other than English. The second most diverse region is the East Midlands, which is home to the most linguistically diverse local authority: Leicester UA. At the other end of the spectrum, 97.2 percent of the population in the North East have English as their native language, reaching 99.3 percent in Redcar and Cleveland UA. Speaking the English language has been suggested to be the most important factor in the integration of migrants into British society; of the 7.7 percent of the population in England and Wales whose main language was not English or Welsh in Wales, 6.1 percent are proficient in English, leaving 1.3 percent speaking English not well, and 0.3 percent not at all. Welsh, Gaelic and Irish are all officially recognized amongst others as Minority Languages in the United Kingdom, and as such are protected under the European Charter for Regional or Minority Languages, ratified by the UK government in 2001. Welsh, as the de jure language in Wales, as far more speakers than any of the other regional or minority languages. In Northern Ireland nearly a fifth have some skills in Irish, and in Scotland 1.7 percent of the population have some skills in Gaelic. In the academic year 2013/2014, 24 percent of primary school pupils in Wales were taught in Welsh, compared with 1.9 percent in Irish in Northern Ireland, and 0.6 percent in Gaelic in the Scottish academic year 2013.